I wanted to buy a low-cal, low-fat wrap for sandwiches (yes, thinking about my laptop lunch makings) and found among the wraps a weird looking oblong wrap. Brand name is Flatout and after looking at the nutritional values of those available, I got the Honey Whole Wheat one. It’s a lot of good bread for just 1 point. Odd though, I can’t find it on the Flatout website. This is the closest to the nutritional value that I found: Multi-grain Flatout. The texture is great. It’s not scratchy or heavy wheat. It didn’t fall apart like the one tortilla ‘sandwich’ that I made did. I looked on the website to try and figure out how I was supposed to use it. I found a few recipes but no play-by-play. So, I went with the generic “put the stuff on round end of the bread and then roll tightly.” I smooshed the cheese on the bottom using a wet tablespoon. It made the spreading of the cheese much easier. I then put on spinach, some thinly sliced turkey breast, and some slices of tomatoes. I rolled up from the filled end as tightly as I could but couldn’t do too tightly because of the tomatoes. It held together very well considering I take my sandwiches so dry — no mayo, etc. I sliced it in half and it still held up well. Fantastic product! I can’t wait to try some other ideas with it. Interestingly enough, after I bought it, I saw a fellow blogger post her fajita photo made with Flatout bread. So weird to go from never knowing about a product to buying it and seeing it in use shortly after! So with the sale on chicken, there was a sale on avocados. I grabbed one and had no idea what I was going to do with it. A previous boss used to rave about this Greek dressing and avocado. So, I put together some torn romaine, quartered tomato and half the avocado. 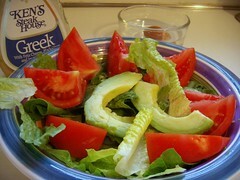 Drizzled with a little Greek dressing and enjoyed! The only problem with the dressing is that it’s about 3 points which is a bit high. It’s very delicious though.